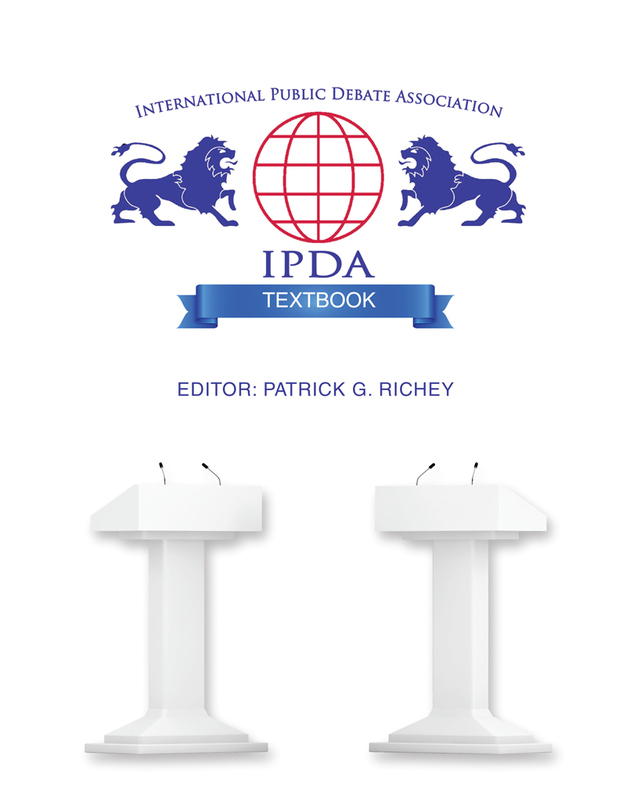 This foreword has been provided by IPDA President Keith Milstead and Executive Secretary Web Drake in an effort to synthesize and define the true spirit of the International Public Debate Association and to provide this text with a vision for what the organization was, is, and should be. First, thank you for taking the opportunity to utilize this text in your classroom or for instruction of your competitive program. It has always been the desire for our organization and its competition to provide an open forum where students and the community as a whole can partake in a real exchange of ideas and allow public debate to flourish on our campuses. In order for this vision to remain and endure, two ideals help IPDA to distinguish itself from other brands of debate. At the core of IPDA is the use and inclusivity of the “lay” judge. This is perhaps the most aggravating for debate purists that witness our competitions after being exposed to other formats and norms. Yet, nearly all of those very formats were intended to provide a similar atmosphere whereby persuasion, oratory, and understandability were at a premium. What caused the evolution of those formats was essentially the ballot. When trained judges and coaches are the predominant decision-makers for winning and losing, those traits often become a lost art. This is not to say that scholars are unworthy to decide rounds; on the contrary, they simply come to expect a style, delivery, and vocabulary that few outside of a debate community can appreciate. If we want public debate to remain public and based on rhetoric and persuasion, geared toward a “real world” audience, and charged with preparing our students to succeed in any field, we must continue to adhere to this principle; that debaters must be judged by lay judges. Secondly, the use of evidence within competitive rounds has provided an equally contentious concern among some debate scholars. It is strictly forbidden to produce printed evidence in a debate round per IPDA rules. This is to mean that debaters may refer to their hand-written notes and cite sources for support of argumentation, but may not physically have the article or evidence in a round. The purpose of this rule was, at its foundation, to make the debate predominantly about the exchange of ideas and argumentation rather than simply a reading of evidence in the debate. It is our hope that IPDA debate continues to utilize supporting materials as just that, supporting materials. Good persuaders will, at times, need evidentiary substantiation in order to make their claims. However, it is imperative that evidence not be the sole deciding factor in our debates. This is what keeps our format unique and the persuasive priority on ideas, rhetoric and delivery. It is the very combination of these two principles that provide the pillars for IPDA. So long as our debaters are trained in the art of persuasion and the importance placed on the very tenants of Aristotle’s proofs, this format can and will be true to its roots. We can continue to provide an environment that excels in career readiness for our students and a training ground for real oratory and critical thinking. The format of the International Public Debate Association teaches its competitors to be good. It teaches them clarity, critical thinking and persuasion. I could go as far as to say that it teaches them manners, presentation, and hygiene. But the argument that I find myself unable to make, the argument that I most desire to make, is that IPDA teaches statesmanship, that it teaches true rhetoric. That it enables our students to learn and to practice public address at its highest level. The level reached so rarely in “real” life, but the level reached for by all who would demand an audience. The level reached by Lincoln, by Roosevelt, and by Reagan. The level missed so famously by both Bushes, by Clinton, by Nixon. The level of the Gettysburg Address, the Challenger Address, the Day of Infamy Address. And, of course, this problem is far from unique to IPDA. Public speaking teachers, corporate consultants, professional speech-writers, and every debate organization ever formed have all, at least at some level, grappled with this very issue. How is IPDA to be any different? Are we to teach the wind-up oratory of collegiate individual events? Are we to succumb to the logic-only oratory of Parliamentary and Cross-Examination debate? Or are we to continue to be appeased at the stumble-bum, ho-hum rhetoric of most of our own competitors? I say we can do more! I say we can raise the level of statesmanship expected and practiced in our classrooms and at our tournaments. I say we can and should aim higher! In certain circles, Public Debate is derided as value debate dedicated to the inane, concerned more with the frosting than the cake. I say IPDA is in the perfect position- historically, culturally, and institutionally- to practice and to teach more than “college forensics.” I say IPDA can and should be a vehicle to produce true rhetors, statesmen (for lack of a more gender-neutral term) able to move mountains with the sound of their voice, to inspire action in the masses, to change the very course of history with the force of their logic. Which all sounds wonderful in the abstract, but how do we do it? How do we succeed where others have failed so dramatically? How do we achieve what our textbooks never even dare to dream? How do we systematize that which many would argue is fleeting? How do we dare to expect that which is an exception to the rule? We do so like true scholars. By identifying it, by analyzing it, and by synthesizing it. In my experience, true rhetoric, true statesmanship, address that inspires and moves, speeches that transcend time and place, have five common characteristics: content that matters, logic that works, passion that moves, values that transcend, and a rhetor who cares. Anything short of that dishonors the memories of great orators from Demosthenes to Barbara Jordan and Edmund Burke to William Jennings Bryan. It also fails to realize the dreams of Alan Cirlin and Jack Rogers. And perhaps most importantly, it sells shorts the potential of those yet-unnamed students who are to pass through our teams, our rounds, and our lives in the years to come. There is no weapon more dangerous, no tool more useful, no force more powerful than the spoken word. We must teach it with care and yield it with precision. The challenge is ours for the taking. The world awaits. Many great orators have partaken in an IPDA event, and many more have learned invaluable skills that have translated into their careers. It is up to us as educators, students, and competitors to embrace public debate for what it is, and more importantly for what it can be; a difference-maker on our campuses and in our communities. May this text aid in your growth to make that difference one argument at a time.